In Blue Hill, Maine, the graceful house built in by Jeremiah Thorndike Holt, influenced by the designs of Asher Benjamin, has over looked the tiny village square---triangle, really---since 1818. For the last forty years, it has been the home of the local Historical Society, who display there the artifacts that bring to life the town's past. Barely altered since original construction, the house required only minor repairs and redecoration when purchased by the Historical Society. This decoration reflected the taste of the era in historic interiors. 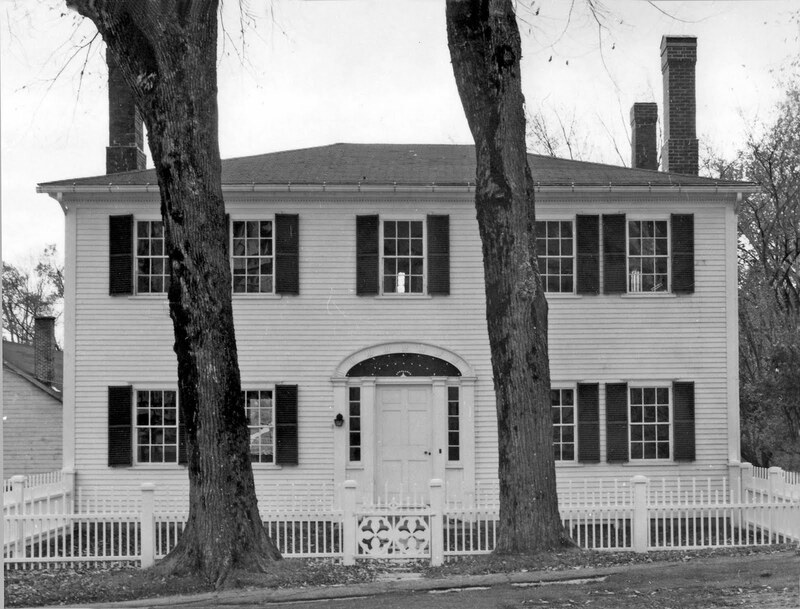 The showpiece of the Holt's 'mansion house' was the parlor, with wordwork carved with a rope motif, and recessed window embrasures with folding shutters. Paint scraping at the time indicated a green-ish paint, and a drab dark olive color was chosen. 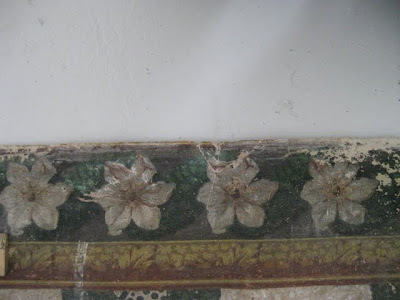 These scrapings also determined the interesting fact that the skirting boards in the room had been painted with what the restorer referred to as 'cart wheel blue'. Sadly, it was decided, in the interest of 'good taste', not to replicate this scheme. A modern commercial wallpaper in a 'colonial' design was used absent resources for a more appropriate paper. The Holts, shipowners, suffered reverses soon after the house was completed, and a leaded glass fanlight was never installed in the space over the front door. Instead, the fan is a board, with a spiderweb grid of lathing applied, painted black, with gilt circles, to imitate a glass fanlight---a most charming economy. Last year, the parlor decoration was showing its age, and the house committee, under the leadership of Susan Gurin, decided to undertake a new interpretation for the room. A person who had been a member of the original committee 40 years previously remembered the 'cart wheel blue' reference, and a scraping determined that indeed not only was the skirting board originally blue, but also the floor. New scrapings of the woodwork, with new knowledge of how paint ages, indicated that actually the greenish hue was due to the deterioration of oils in the original pigment, and that the woodwork was likelier a 'stone' color, fashionable in the early 1800's. The wallpaper was removed, and the room re-painted in this color scheme. The transformation was remarkable---the blue floor echoed the harbor only a few dozen feet from the parlor, and the off white paint showed the woodwork to best advantage. Now the question remained: What to do about the walls? What would be appropriate? As it happened, 30 ago, when another house in the village, built in 1803 and occupied by Matthew Ray, a toolmaker, was being re-wired, it was discovered that hidden behind the later Greek Revival woodwork and walls installed in during an 1840's remodeling, the original Federal parlor and original decorative scheme were intact, down to woodwork wallpaper and paint colors. 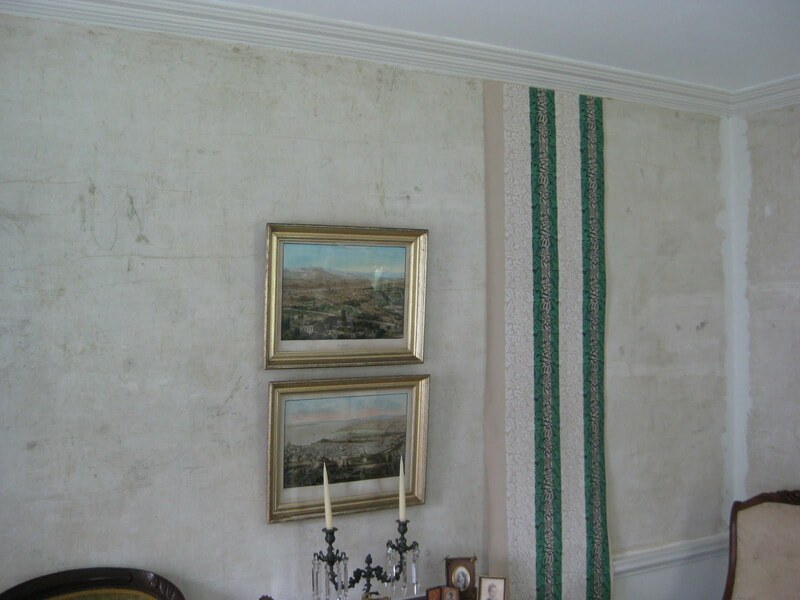 The wallpaper appeared to date from around 1815, and was probably manufactured in Boston. 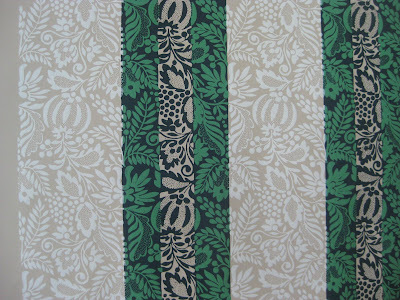 It was a boldly designed neo-classical stripe, with an elaborate floral border. The paper was probably printed in Boston, and was made from large square sheets rather than rolls, as modern paper is. The border, more finely printed, appears to be of French manufacture, a reminder that expensive and fashionable goods were available up here even at that early date for those who could afford them. 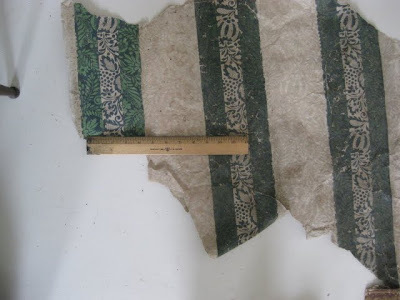 Although it was impractical to completely uncover this time capsule, samples of the wallpaper were rescued and saved. After viewing commercially available period designs, the Historical Society decided to reproduce this wallpaper, a surviving example of the the taste and goods available in the town in the early 1800's. But how to reproduce it? 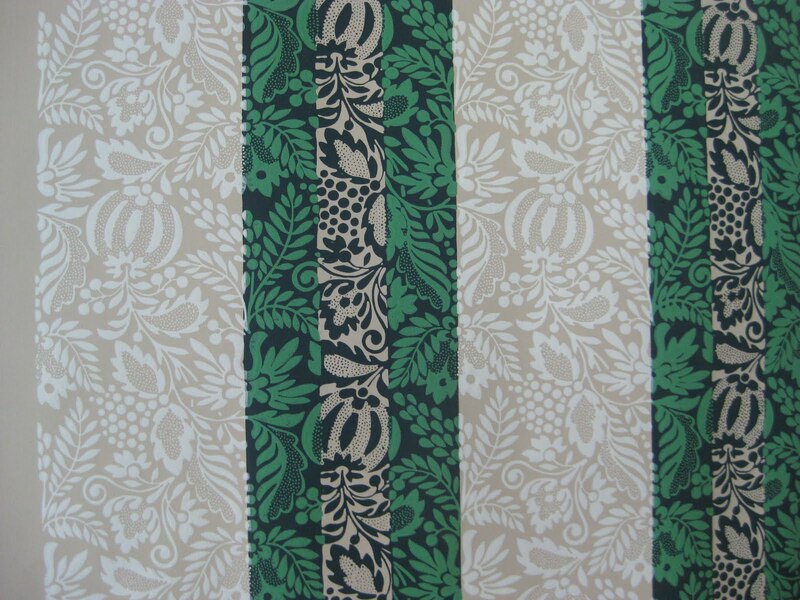 Enter the amazing firm of Adelphi Paper Hangings, makers of authentic block printed wallpapers. Steve Larson of Adelphi was contacted, estimates were made, and the Historical Society decided to take the bold step. Fundraising was undertaken, with rolls available for adoption at the exact figure of $378.00 per, and they were snapped up by generous members of the community. Printing blocks were hand-carved by Adelphi's craftsmen, colors were matched (one section of the original paper retained particularly clean and bright samples), and only a few days ago, the samples were pulled and approved, and within weeks the paper was complete. The first sample was taped up a few days ago and approved, and within the next weeks, the parlor will greet visitors for the summer, with its original blue & white paint scheme enhanced by a handmade reproduction wallpaper in a pattern familiar to earlier residents of the town. The sample is hung on the wall. The paper will be hung above the dado only. The two gilt framed lithographs of Italian Ports were brought back as mementoes by a Blue Hill sea captain in the1840's. Adelphi will be adding the design to their catalog, tentatively called 'Blue Hill Fancy Stripe'. While the Dilettante makes the disclaimer that he in no way has commercial affiliation with the wonderful company, he would be delighted to see the paper sell well so the Historical Society can benefit from royalties. And for those who cannot get enough Dilettante, or even those who get a little too much, I can be found in print, not once, but twice in the July issue of Portland Magazine, holding forth on a famous modernist house on Mt. Desert (click HERE) , and about scenic wallpapers in Maine houses (click HERE). And now, if you'll excuse me, I have some dry wall to prime, or my new store will never be ready. A very impressive post! I love the decisions made by the Historical Society and the new wallpaper is fabulous. As an artist, I love seeing the creation done by the hand-woodblocking. Congrats on your new endeavors!! Can't wait to see the shop! Thank you for the great post. Such an eye for detail and such an ability to describe a process are enviable traits. LOVE that paper. I hope you show the final result here! I have heard of many things being adopted for fund-raising campaigns, but adopting a roll of art-made wallpaper is a first. How delicious. over the front door of Holt House. That sort of architectural improvisation always gets my vote. I am in my customary crisis. I limitlessly admire what Adelphi does with those papers. They could not be better, and anyone who wants that sort of thing has no better place to go than Adelphi. OTOH, two of my houses are of the same age, and I would rather blow my brains out with a large caliber pistol than daily encounter such ugly wallpaper on my walls. P.S. Toby is quite right about the improvisation above the door. Ancient, I see your crisis as a completely reconciliable one. I too limitlessly admire what Adelphi does, and may in fact have been the person who led the organization to Adelphi. I am also fascinated by Old wallpapers, although I am actually not a wallpaper user myself (how's that for a crisis?). And of course, in the case of the historical society, modern taste SHOULD be in suspension, in favor of demonstrating the community's taste of other eras. At the end of the day, some of Adelphi's papers are quite beautiful, and some are not, much the same issue one encounters in the Brunschwig catalog. I am familiar with a Federal house that has a different, and each very bold reproduction wallpaper in every one of its many room, applied in the 1920's, and while I could never do it myself, the effect is nothing short of gorgeous. And there ya have it. PS, as for the trompe l'oeil fan, I have been regularly walking past it since childhood, and 50 years later it continues to delight. Lovely post, that was my business for years, custom papers also. It can make or break a room. well, of course, authenticity and not modern or personal taste are the considerations at work here, and indeed floor and skirting board did share the same original coat history, followed by black boards and brown floors in the next, and then white boards and brown or red floors after that. Just by coincidence, one of the handsomest rooms of my youth was in a 1930's international style house, with a New England slant to the interiors, with a dining room with blue woodwork and blue floor. Very beautiful. That is very international style though, is it not: everything the same color? My grandparents' international style house (designed by my architect grandfather) had floors, walls, trim, etc. all in the same green shade. I always thought it was such a beautiful house and the light just reacted so beautifully in that environment. Stefan, how interesting! Can we look forward to a post? In my years as a critical viewer, as opposed to creator, I find that there are no rules. Just things that some people pull off better than others, when it comes to decoration. One person's bad wallpaper can be another's master stroke. Emily, you have made me drool! I visited Kenmore years ago, and the rooms were still presented in white wall-and-damask curtain style---handsome, but one wondered what was originally done. The idea of one of those rooms in green flock sends me to the moon---and fascinated to hear of the glass box. And btw, Adelphi was a dream to work with---they made the difficult look easy, and were the very souls of professionalism and efficiency. Treasures indeed. wallpapers and the perils of producing them. They can be very effective when done properly, yet people recoil at the mere mention of them. It has everything to do with association, in this case cheesy hotel lobbies or Italian restaurants from the 1960s. All good things become corrupted eventually, when they are mass produced and imposed upon the masses. I recall a perfectly beautiful example of flocked wall paper inthe state bedroom at Clandon Park, discreet pattern in 2 tones of claret red, the flocking done in wool. That was Mr Fowler's doing. And "Italian" restaurant never sprang to mind, I can assure you! I had the pleasure of working with Adelphi while at Mount Vernon. What an amazing group they are. While we never ended up reproducing any papers, it was a fascinating experience. The Holt House has never looked better! I can't wait to see it in person. this sort of thing still goes on. speaking of wallpaper, my grandmother was an addict and her favorite was those papers depicting large english country garden or estate themes. every inch of her walls in her part of the house (about 1800 square feet) were covered by papers depicting overdressed folks strolling and lounging in gazebos, loggias and teahouses on english estates. sadly, under my reign, these succumbed to a session of making maple syrup in the house - btw, a wonderful way to remove stubborn wallpaper and have a topping for your sunday cakes. i kept a few scraps as a memento though. I'm an Atlantan with Virginia roots, I just thought I would point that out. Many reinterpretations have presented themselves with regard to actual paint colors used in the 18th century. Where I'm from the colors which were predominant were based on colors used at Colonial Williamsburg in the 1950's and 1960's. Now technology has found the colors were not actually the colors from the 18th century, but ancient oxidized samples which had changed color. It has now been found, like your post suggests, that 18th century colors were quite strong and bright. 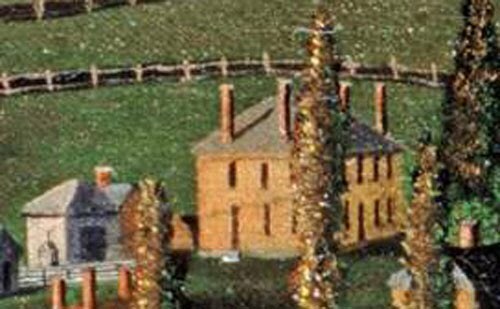 If interested, reinterpretations have happened at Colonial Williamsburg, Monticello (Ralph Lauren donated the cost of repainting the dining room a shocking yellow, the FFV's are spinning in their graves!! ), Montpelier has been totally restored and is still in the process of doing so, many thanks to the Duponts (if I remember correctly, at a cost of millions of dollars? 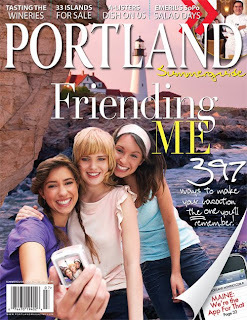 ), Mount Vernon and many other historical sites in Virginia and other states. I would imagine the colonials wanted a little cheer in their lives just like anyone else and they were quite sophiscated at that!! It's amazing how these buildings and rooms stand the test to time and are still quite stunning. And on another note, maybe Martha will leave Bar Harbor or the state of Maine the Edsel estate to the people as a self sustaining museum for everyone to enjoy? Now that's a good thing!! Janet, indeed they are an amazing company. Atlanta/Virginia, indeed I have always found it a fascinating study, and even the revised opinions get revised (for example the verdigris dining room at Mt. Vernon, in its second paint analysis version of that color. 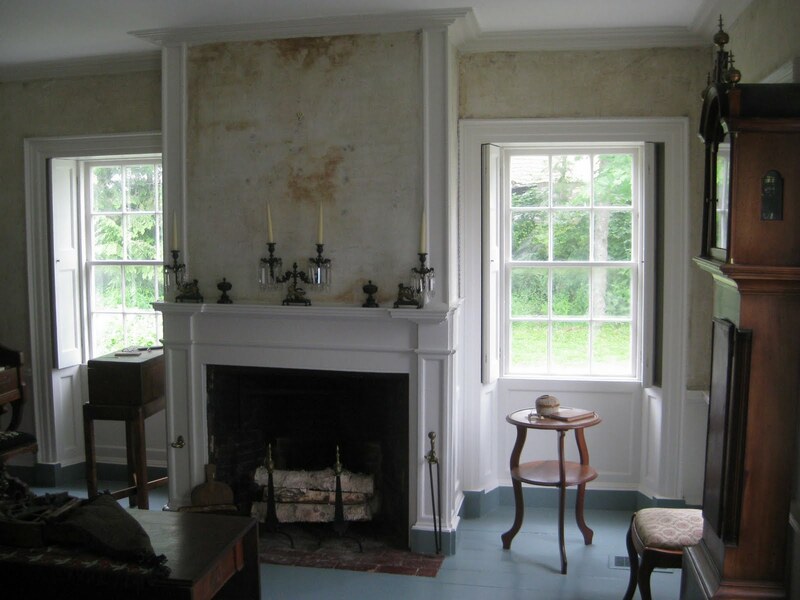 I am president of a house museum, once owned by a folk artist named Jonathan Fisher, and we are in process of seeking donations to do analysis on our paint colors, currently all based on oxidized scrapings from the 1950's. colours need to be knocked back slightly. and wood tend to fade and mellow with time. To go the academic route of juxtaposing those old carpets etc against brilliantly coloured walls, always strikes me as a mistake. Not that I'm for one minute advocating a return to the bogus "Williamsburg" palette of the 1940s and 50s. Who knew that wallpaper could bring out such a lively discussion. It's been a rather "if you carve it, they will flock" kind of conversation that I enjoyed with gusto. Oh, and PS, Atlantan Virginian, I quite like the idea of Martha Stewart leaving Skylands as a museum. And can guarantee her neighbors wouldn't. Amazing content. Thanks for sharing.